Under the large umbrella of the U.S. stock market, there are indices, sectors, market capitalizations and style boxes. For example, the five major stock indices are the Dow Jones Industrials, S&P 500, S&P 400, Russell 2000 and NASDAQ 100. 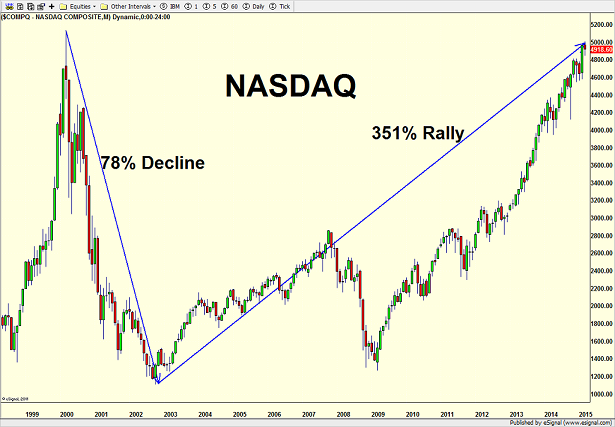 Sure, you can argue that the NASDAQ belongs instead of the 100. We also have large cap, mid and small cap along with growth stocks and value stocks. I often write about different kinds of leadership in good times and bad times, especially on the blog. For those not totally familiar, growth stocks are companies that are expected to grow at a rate much faster than the market. While some are profitable and some are not, those which have earnings usually see their earnings grow much quicker than the overall stock market. Growth stocks typically do not pay dividends as they plow any and all available cash back into the company for growth. Growth stocks are almost always found in the technology and biotech sector although they can be found elsewhere as well. Value stocks are the exact opposite. Those stocks usually have earnings and their growth rates are often slower than the market’s. Their valuations are typically less expensive than the market’s and certainly the growth stocks’. Price to earnings or PE is one popular metric analysts use to determine value along with price to book value and free cash flow. Most value companies pay dividends to shareholders as a way to entice investors to buy the stock. When companies come public, they are usually growth companies who do not have any earnings. Apple Computer in the early 1980s, Microsoft in the mid 1980s and Amazon in the mid 1990s are some of the more glamorous ones. Ford went public in the mid 1950s among a tremendous amount of hype, glory and exuberance. As companies progress and mature, they begin to earn money and more money and perhaps pay a dividend. Their growth rates peak and begin to slide and slide along with their PE ratios. In short, they go from growth to value. Intuitively, the average person believes that growth companies have better track records of rewarding shareholders than value companies. However, the opposite is true. People are very surprised to learn that over the long-term, value typically beats growth. Now that I have given you a brief tutorial on what growth and value are, let’s turn to the observation I was attempting to make. I love to compare things in the market, on a daily basis, on a weekly basis, on a monthly basis. There are all kinds of trends that develop. Some even offer warning signs. Below you can see a chart of large cap growth divided by large cap value. When the line is going up, growth is beating value. When it is going down, value is beating growth. For all of the 1990s growth trounced value, fueled in large part by technology. Eventually, growth saw two peaks in 2000 as the Dotcom Bubble was about to burst. From that 2000 peak, you can see that value led all the way to 2007 as growth gave back nearly 100% of its massive gains. The chart above doesn’t continue to present as the indices are no longer available to me. Instead, as you can see below, I picked up two ETFs which essentially say the exact same thing although the two ETFs began trading in 2000. Let’s start with the far left Dotcom peak and subsequent bottom in 2007. 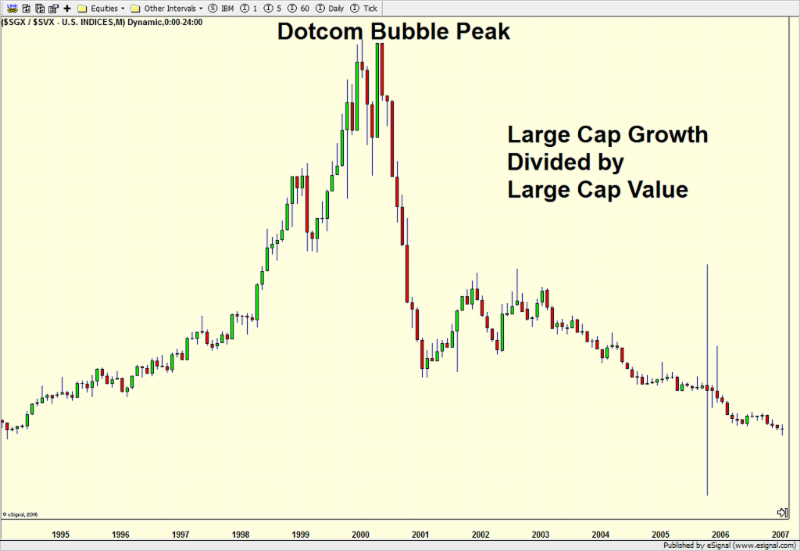 Since 2007, growth has trounced value and almost back to the nosebleed levels of the Dotcom Bubble high against value. There is nothing super special or meaningful about a specific relative price level. 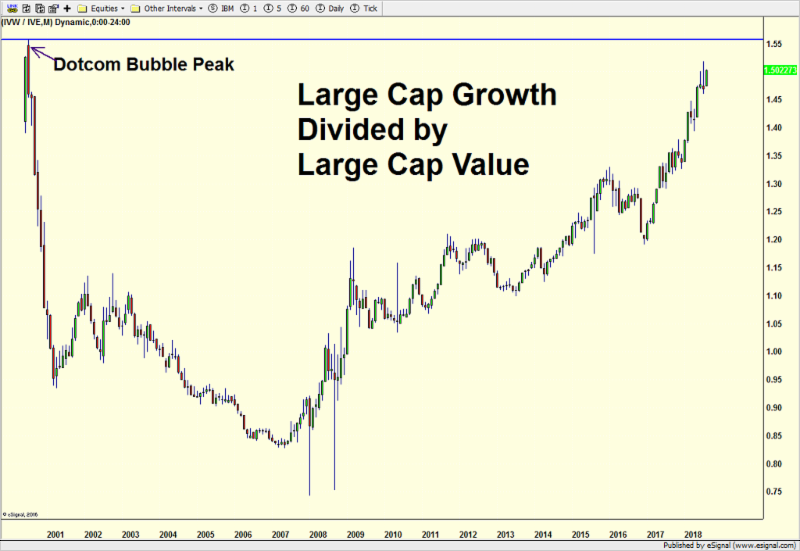 The growth/value relative value line could keep going up and become even more expensive than it was at the Dotcom Bubble Peak. However, it is certainly very concerning from a relative valuation standpoint that growth has decimated value for so long. In other words, while valuation isn’t a great timing tool for the end of a trend, it absolutely does say that sooner than later, value stocks should begin to outperform growth stocks in more than just a small way and for more than just a few days, weeks or months. The best example of today’s hot growth stocks is FAANG, Facebook, Apple, Amazon, Netflix and Google. I wish Tesla was part of that group as well. You already know that I am bearish on Facebook and Tesla for the next few years. Netflix is next when a catalyst appears. I think all three stocks can decline by at least 50% by 2021.